Kuala Lumpur, Malaysia -- Wesak Day is celebrated differently in other countries and even falls on a different date based on the respective tradition’s lunar calendar. StarMetro takes a look at how the various Buddhist organisations in the Klang Valley observe this day. The two main schools of Buddhism are Mahayana and Theravadha. The Mahayana tradition spreads from India to China, Korea, Japan, Tibet, Bhutan and Nepal while the Theravadha tradition spreads from India to the east, to countries such as Myammar, Thailand and Sri Lanka. Many also take this opportunity to visit the four holy places of Buddha namely Lumbini (Buddha’s birthplace), Bodh Gaya (site of Buddha’s enlightenment), Varanasi (site of Buddha’s first teaching) and Kushinagar (site of Buddha’s Parinirvana). One thousand butter lamps (substituted by candles in Malaysia) will be lighted, 1,000 flowers used for decoration and 1,000 food portions offered amid chanting of Buddhist sutras at the Thrangu Dhamma Society in Petaling Jaya today. 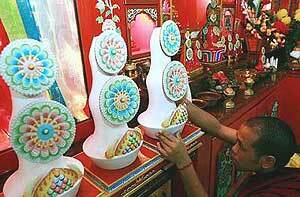 << Religious: Shalsey is a symbol of offering in Tibetan religion used in a religious celebration. Devotees will go on a procession around the Tibetan Buddhist temple to bless the place, colourful longta (prayer flags) are hung up while prayer wheels will be spun as they chant the Buddha’s teachings. It is believed that spinning the prayer wheels inscribed with mantras work like reading it repeatedly, so more merits can be reaped through the chanting. They are also here to receive the Lama’s blessings and take vows in front of him. Others take the opportunity to set birds and fish free. “We are having only a small procession at our centre because we are in a housing estate but devotees often join the larger processions in town after the prayers here. “At the end of the one month, devotees will dedicate the merits gained for world peace and harmony,” he added. Religious: Shalsey is a symbol of offering in Tibetan religion used in a religious celebration. The concept of Zen will be imparted through activities lined up for Wesak Day celebrations at the Dhamma Drum Mountain Buddhist Association founded by Master Sheng Yan from Taiwan. Apart from the customary rites of bathing the Buddha figurine, offering lighted lamps and welcoming one into Buddhism, the organisation will also have a charity bazaar selling handicraft made by members using recycled materials to spread the green message. “For us, Wesak Day is a day to thank Buddha for giving us his great teachings that has enabled us to better our lives as well as that of others,”said Venerable Chang Miao. Beautifully-lit paper lanterns and Buddhist flags hung around each home, shops and temples is typically what Rev Rohana remembers fondly of the Wesak celebration in Sri Lanka. “Most of the Wesak activities here in our temple and in Sri Lanka are similar. The only difference is that the decoration is displayed for the whole week,” said Rohana who is a resident monk at the Sri Lanka Buddhist Temple in Sentul. Apart from the bright lights and observing the Eight Precepts, float processions are also popular in the country with a population of 70% Buddhists. “Devotees will walk on the streets especially in small towns and villages with floats just like what we have here,” said Rev Shantha who had been a monk at the same temple for 14 years. While at the Buddhist Maha Vihara in Brickfields, Kuala Lumpur its president, Leslie Tilak, agreed that Wesak lanterns or ‘Wesak Kudu’ were indeed a must-have. The temple is building a two-storey tower with 40 lanterns of different sizes circling the stand. Thai Buddhist Chetawan temple resident monk Rev Woon Kitisakh Panyatipo said float processions were also popular in Thailand. 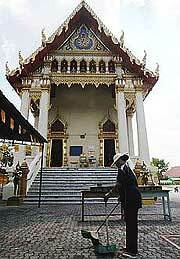 << Getting ready: A temple worker cleaning up the grounds of the Thai Buddhist Chetawan Temple in Petaling Jaya. “There are many Buddhists in Thailand and it is difficult to hold a big procession like the one we have in Kuala Lumpur. “Each temple will have its own procession, where devotees will walk around the temple grounds,” said Woon. Activities lined up for devotees include the pasting of gold leaves on to Phra Phom, a four-faced Deva and Luang Phor Tuad. Bathing of the Buddha is also popular as it signifies purifying the heart and mind of devotees from greed, hatred and ignorance. Watering the Banyan tree is one activity the Burmese look forward to during Wesak as it symbolises achieving enlightenment. “It is believed that by pouring water to the tree, all living beings will have a pure and peaceful mind,” said Malaysian Myanmar Buddhist Association resident monk Rev Cariya. Listening to Buddha’s teachings by a monk, observing the Eight Precepts, lighting candles, offering flowers, alms and sprinkling holy water was the Myanmar practice on the special day. Unlike Malaysia, Cariya said Myanmar did not incorporate float procession as part of its celebration and found it to be an interesting concept. “It is such a thoughtful and nice way to celebrate Wesak at the different temples in the city,” he said. This year, the mythical bird, Karaweik, will take centre stage on its float as it said to bring good luck.